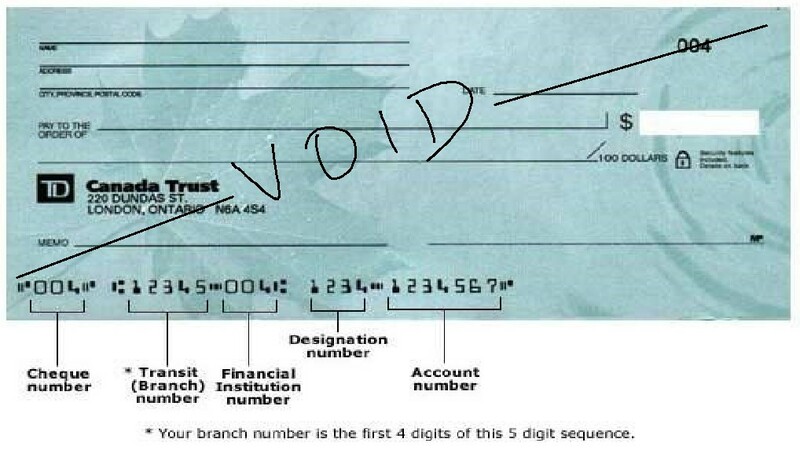 How do I get and provide a void cheque? If you need to provide a void cheque or your banking information for direct deposit or pre-authorized debits, here's what you can do. Simply write "void" across it in large letters and provide that. Or you can just provide the important numbers that appear on your cheque as shown here. You won't need the cheque number. If you do NOT have a cheque, you can locate the account information you need in EasyWeb. Simply login, select the account you want to view, and then select the "Direct deposit form (PDF)" link in the upper right-hand corner. The form provides your account information in place of a voided cheque and is used when arranging for direct deposits or pre-authorized payments.